Now Boswell's No-Bite De-Lite . . . should also add since I didn't get a change to post last night that a buddy shared 2003 Dunhill Light Flake that was supreme. Relaxing after a wonderful pork chops and baked beans dinner with a bowl of Old Colonial in a 1979 smooth natural signed Rossi 1886 OomPaul 124 with an amber acrylic stem. Hello everybody, we have sun and 17°C here in Athens. Some aged ODF via Santa in a Castello Sea Rock foursquare with coffee, watching Arsenal v Burnley. A sunny morning! Calls for PS LTF in a Markus cob, and nuked yesterday's coffee. We made it through the longest night of the year up here in the northern hemisphere! Enjoyed a tasty grilled cheese sandwich and New England clam chowder lunch, and am a third of the way through this bowl of Jock Scott Creamy Malt in a 1975 medium bend sandblasted looking, smooth on the sides yellow Pioneer meer with a black ferrule and vulcanite stem in the military mount style. A bottle of Cheerwine made with pure cane sugar is my drink. Now smoking year 2015 Savinelli Doblone d’Oro in the first pipe Trever Talbot made when he went to France many years ago. It's a smooth straight Algerian briar Billiard bowl with a long Canadian shank and vulcanite saddle stem, unbranded. 2001 Christmas Cheer in a Jeantet foursquare with sweet tea. While watching in Murdoch Mysteries the rough Inspector Thomas Brackenreid of Toronto Constabulary my mind went back to our town Police Chief named Dimitrios Bairaktaris. First he joint in the Hellenic Army at 1848 and became an Infantry Officer, he took an active part in the Cretan Revolution of 1866, where he was distinguished for his actions. In 1893 when the Military Police was established he was appointed as the Athens Police Chief. To those who had a propensity for the crime, it caused fear and terror and to those who want calm life, order and security, respect and trust. Bairaktaris was bold, righteous and hard, a real Man of Duty. The "political connections" meant nothing to him, he had no hesitations in Ethic rules, one day himself beat two English sailors and threw them into the sea because they insult in public a Greek woman. He solved many crimes committed in Athens and convinced the prime-minister to make the Copyright Law of the writers. In 1897 he was named Colonel and in the declaration of the Greek-Turkish War of 1897 he was distinguished for his inertia by fighting in the first line of fire animating his men. 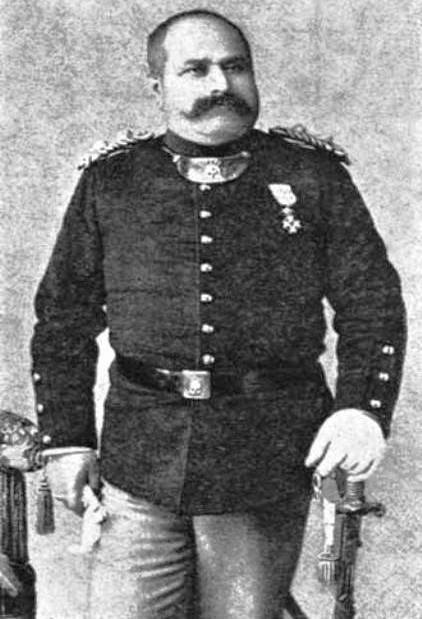 He was retired on March 10 of 1900, promoted to Major General. He died four years later, at the age of 72 in Athens and still his memory is alive. I am smoking New York Pipe Club Jack's Shanty Cigar Leaf Blend while reading incidents of his era, cup of chamomile beside me. Now smoking Watch City Stubb’s Pipe in a medium bend egg 2017 Royal Meerschaum Dragon meer with a black and cream swirl amber colored acrylic tapered stem. Ice tea and bergs is my drink. Just finished smoking Peretti Coffee Blend in a 1979 smooth slight bend H. Jones Ltd. Easy Loader 391 Dublin with a black vulcanite stem. A quarter of the way through this newly opened pouch of year 2011 Villiger Maryland No. 333 in a smooth straight pre-transition Barling 313 T.V.F. EXEXEL pot with a black ebonite saddle stem. The tobacco is rather dry, but the last time I hydrated it with distilled water, it molded, so I'm not making that mistake this time. Ice water and bergs is my evening drink. 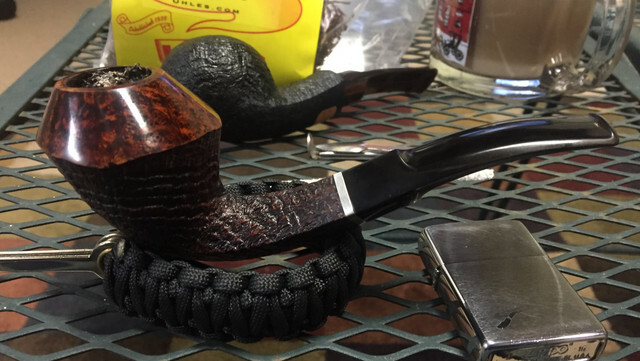 Now smoking Sutliff Flying Dutchman Match in a slight bend black sandblasted Lorenzo Elba Imperia 8636 with an amber colored acrylic saddle stem. Phone chatting with a good friend. This AM a fine bowl of aged OGS in the estate Sav 316 Oscar Lucite. After lunch I enjoyed a great bowl of Pebble Castle from our Wiz, in the estate Brebbia Plum 'bash. After supper had a kick-arse bowl of Revor Plug in the estate Wiley 1/2 bent Galleon. Good smoking day in sunny Arid-zona! 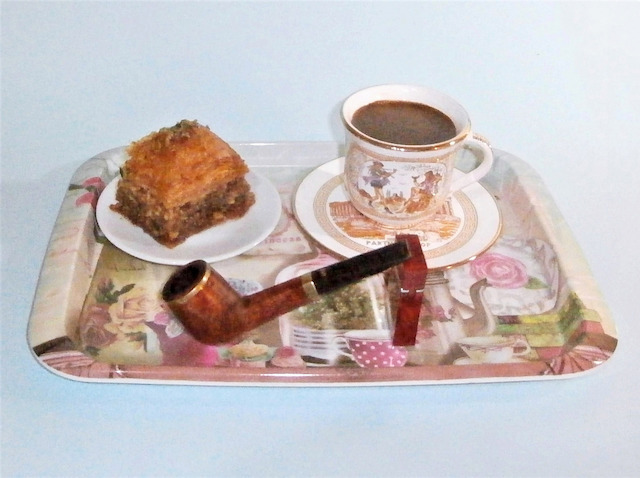 Relaxing after a wonderful chicken and Northern beans dinner with a bowl of McClelland GKCPC Boston 1776 in a 1980s White Pipe straight, smooth octagonal paneled billiard meerschaum with an acrylic yellow cream colored saddle stem. Phone chatting with a good friend.